I’m very pleased to be in great company in two exhibitions at the moment, ‘Strange Business’ at SYSON, Nottingham and ‘Cities of Ash’ at g39, Cardiff. STRANGE BUSINESS is a group exhibition of new watercolour painting presented by SYSON in Nottingham. This exhibition features works using a traditional yet versatile type of painting, which is often overlooked or perceived as old fashioned. Watercolours in this exhibition comprise studies of opacity and transparency, and explore colour saturation, site specificity, found objects and sculptural forms. 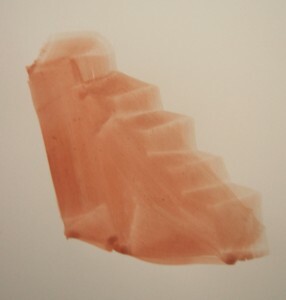 Often drawing upon highly personal subjects and areas of interest, works featured include preparatory studies, explorations of natural materials, installations and film and video – attempting to explore what JMW Turner recognised the activity of painting to be; ‘a strange business’, and artists undertake the task of painting with water and colour in the broadest sense. Flexing the architectural imagination, the artists in Cities of Ash offer the god-like experience of model city panoramas found in civic museums or on observation decks of towering skyscrapers. They each engage in the pursuit of obscuring the urban experience with a fantasy veil, leaving glimpses between its brushstrokes.